Reflective paint coatings will extend the life of your roof in three ways: by reflecting sunlight away from the surface and therefore reducing heat transfer into the building, by decreasing thermal contraction and expansion of the roof membrane (like with Bedec's Super-Flex), and by helping to manage and stop leaks. Solar reflective paint can help to lessen energy costs and simply improve the aesthetics of the roof. Generally, white reflective coatings tend to be water-based and are more suited to new roofs due to their low cost and ease of use. Coo-Var Solar Reflective White Paint is a bright white acrylic coating that reduces heat build-up inside and outside the building. It can be used on concrete, wood, brick and other surfaces, and it’s an excellent choice as a solar reflective paint for flat roofs in good condition, but not recommended for roofs where standing water often gathers. Blackfriar Professional Solar Reflective Paint Aluminium is a blend of rubber, polymer modified bitumen, aluminium and fibre reinforcement. For the refurbishment or repair of porous asbestos, corrugated iron, concrete, tiled and felted roofs. Textured finish, exterior use, bitumen based, fibre reinforced, contains reflective aluminium. A fast drying, solvent based, light and heat reflective paint to protect and prolong the life of roofs and roof repairs. 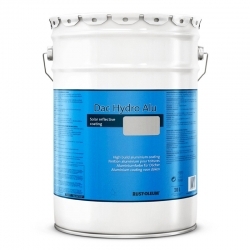 A thin bituminous-based aluminium protective paint of brushing consistency which dries to a silvery finish. Thermilate PRO Insulating Elastomeric Coating is a high quality water-based elastomeric membrane with revolutionary, enhanced composite which makes the paint insulate and reflect heat. PRO Elastomeric cures to form a seamless membrane sealing the surface and ensures unrivaled breathability. As older roofs need increased waterproofing to keep watertight, aluminium roof paint tends to be used. As these products are usually solvent-based heat reflective paint, and are applied in thicker coatings, they are a more expensive option. 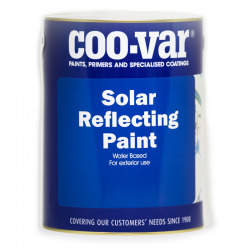 Coo-Var Solar Reflective Aluminium paint dissipates heat and sunlight. 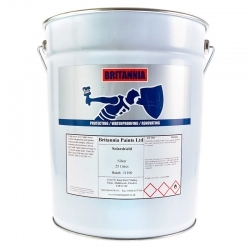 This bituminous aluminium paint is a solar reflective roof paint that can be used on brick, wood, concrete and stable felt. 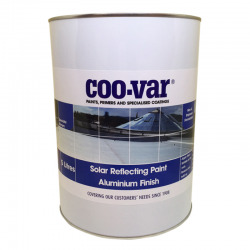 Coo-Var Solar is a silver reflective paint and is dry to the touch around three hours after application using a brush or roller. 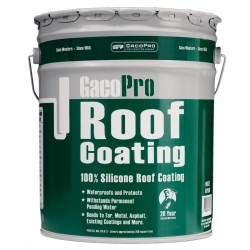 GacoPro Roof Coating is an entirely silicone roof paint that can be used on flat and pitched roofs and guarantees an amazing waterproofing coating. GacoPro can be applied as a spray, by brush or roller and on most existing roof coatings, including plastisol, felt and asphalt. If you use GacoPro Roof Coating in Solar Reflective White, you can add a huge reduction in thermal shock to the waterproofing properties, as it reflects more than 85% of the sun’s rays, further extending the life of your roof, as well as saving energy. An exterior reflective paint for primed metal and bitumen roofs, Everbuild 907 Solar Reflective Aluminium Paint reflects both heat and light and protects roofs from long term damage. It’s a pre-thinned bituminous aluminium paint that ends up as a lovely silvery finish, leaving your roof looking great as well as protected. 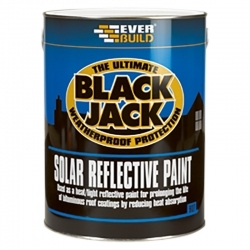 Blackfriar Professional Solar Reflective Paint is available in two types, both specially developed to reduce heat gain on dark coloured roofs. Both can be applied to metal, concrete, brick, bitumen, among other surfaces. Specifically, for exterior use, they are self-priming and need two coats to give the best finish. The white reflective paint is water-based and great for adding reflectivity to new roofs whereas the aluminium finish is great for weathered and old roof surfaces. Bedec Super-Flex is a flexible and elastomeric coating for roofs and walls, quickly applied by brush, roller or spray which dries to form a high build, seamless waterproof membrane. Bedec Super-Flex economically prevents or cures all types of leaking roofs, gutters and walls. Easy to apply, Bedec Super-Flex remains flexible and elastic to allow for movement of the substrate forming a long-life protective coating for weatherproofing roofs and walls.